As soon as you see Gus' photo, you think to yourself, 'Man, that's one ugly mutt!' How about the world's ugliest. 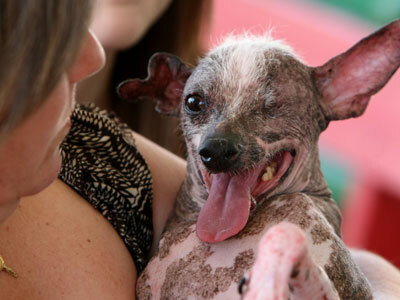 That's right, Gus, a three-legged, one-eyed, cancer-afflicted and hairless Chinese Crested dog won the title of the World's Ugliest Dog at the Sonoma-Marin Fair out in California. Lets just say, we can see why Gus would be deserving of the title. This not so cute canine has a mug only his owner Jeanenne Teed could love. The climb from underdog to top dog has been a bumpy ride for him. He came from an abusive home, had to have his leg amputated because of a skin tumor and lost his eye in a fight with a tomcat. As for what will become of the $1,600 in prize money, it will be used on cancer treatment for Gus. He's one tough dog! 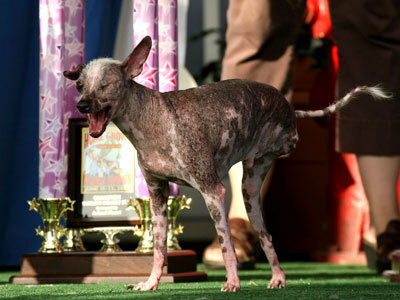 (source) Watch Gus win the 2008 ugliest dog title and see past ugliest dog winners from 2007 and 2008.